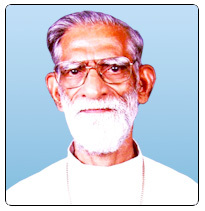 Bishop Abraham Mattam was born on 21 November 1921 at Melampara, in the parish of Narianganam in the eparchy of Palai. After his primary education at Narianganam and Melampara and Middle and High School education at St. Mary's High School, Bharananganam, he joined the Vincentian Congregation on 17 January 1941. After his priestly formation at the Archdiocesan Minor Seminary, Ernakulam and St. Joseph's Major Seminary, Alwaye, he was ordained priest on 15 March 1950. He obtained his doctorate in philosophy from the Gregorian University, Rome in 1958. Returning from Rome he held many offices in the congregation such as Rector of Vincentian Minor Seminary, Angamaly, Rector of Vincentian Vidhyabhavan, Alwaye, Superior of Vincentian House, Thodupuzha, General Councillor of the congregation, etc. He was also visiting professor at Mangalapuzha Seminary from 1966 onwards. He was nominated Apostolic Exarch of Satna on 29 July 1968 and was installed on 9 January 1969. He was appointed Bishop of Satna on 26 February 1977 and was ordained bishop on 30 April 1977. He retired from the office of the Bishop of Satna on 14 January 2000, but continued as administrator of the diocese until 12 April 2000.